And the book did not disappoint. It met my most important criteria – its a rocking good, entertaining story. Like some other authors I’ve been reading lately – Garth Nix, for example, Charles de Lint uses the familiar and satisfying themes of fantasy, but twists them hard and keeps things fresh. There are no easy answers here. Who is the villain? Which version of the story is the true one? There are several main characters: Sara Kendell and her uncle Jamie – rich and eccentric but open to adventure. Kiran Foy the musician and apprentice wizard who is maybe just a little but too laid back. Sara and Jamie’s home, the rambling Tamson house is a character in its own right, and one of the more intriguing fictional houses . And this is just the beginning of a list of believable empathetic characters. I enjoyed the good dollop of detective thriller that has been stirred into this fantasy. I loved Inspector John Tucker. Here is another familiar character – the hard bitten cop who does not “play it by the book”. But John Tucker is not a cardboard cop – he has the ability to see the human side of the suspects he questions, and is unexpectedly sympathetic. He reminded me of one of my other favourite fictional policemen – Terry Pratchett’s Sam Vimes. I sometimes experience a book as a sort of Rorschach blot – I tend to find meaning in it that mirrors my current concerns. This book spoke directly to some of the insistent questions I have been asking myself about the responsibilities of a teacher. Moonheart explores the conflict between the teaching traditions of Europe and Native America, and the tension between them is at the core of the story. Does a student learn best when in their unaided struggle for knowledge, and if so, what is a teacher’s role? Ah, they were old and thought themselves wise because they’d grown into their craft through study and trial rather than being born to it. They thought those born to magic were wild, uncontrolled, somehow not deserving of the gifts that they had to work so hard for themselves. Somehow they considered themselves more ennobled for the striving it took them to master their craft. What did it matter how one grew one’s horns, or how swiftly? It made him angry, this teaching through riddles and this taking two steps sideways for every one steps forward Tests and testing. What need was there for such? His people hold great store in an individual’s private struggles. It is not so with our Way. With us the knowledge is secret – but only until one asks. The trust between teacher and student is a recurring theme, and the book offers no easy answers to the questions it raises. 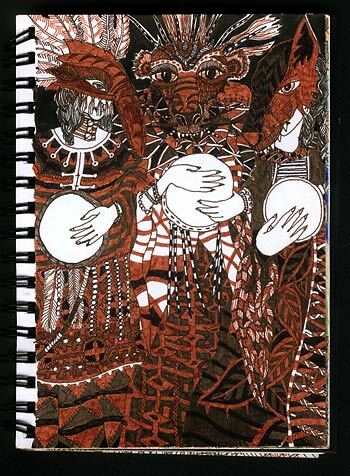 Its one of those rare books which convinces you of the internal validity of its world – you feel that the story existed before you started reading, and that it continues still after you left. 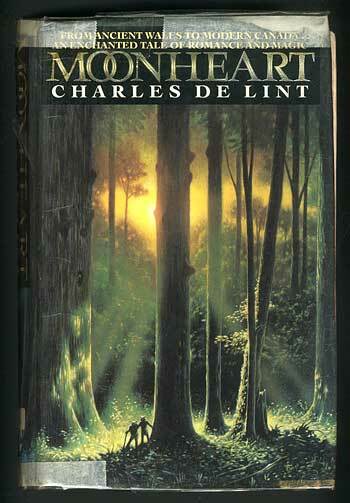 I’m going to enjoy finding more books by Charles de Lint. The Band-Aid of Fantasy – so what’s wrong with escapism?